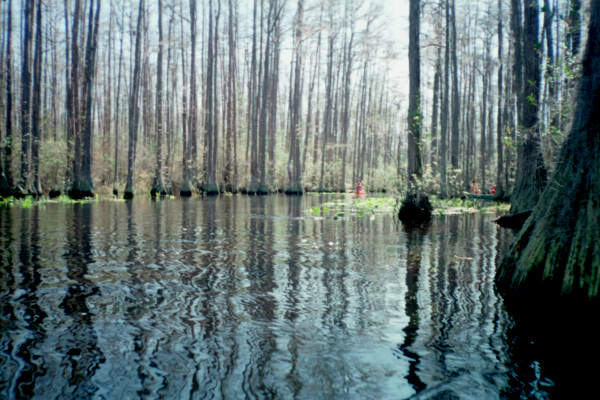 The pictures from our trip to the Okefenokee Swamp are below. First, there is the text of an environmental alert that the Sierra Club has asked to be included on this page. If you want to help protect this wonderful and unique natural resource, then read on. Click here if you want to jump directly to the pictures. By the way, the pictures are fairly detailed, so they do take a few minutes to load at 28.8 bps. Grab a drink and when you get back, the pictures should be viewable. NEW: I have received a letter from a resident near the Okefenokee Park. 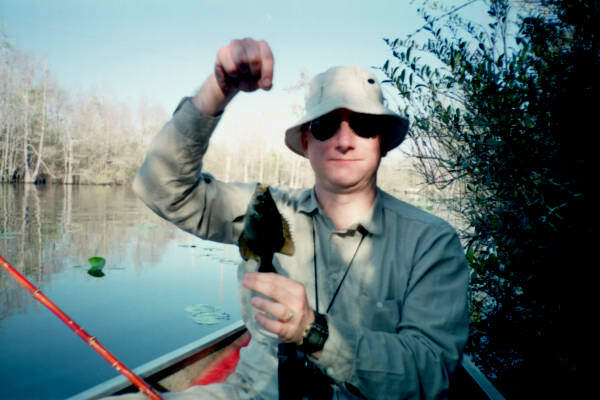 He expresses his concern with the environment around the Okefenokee in a most eloquent manner. Don't miss it below. 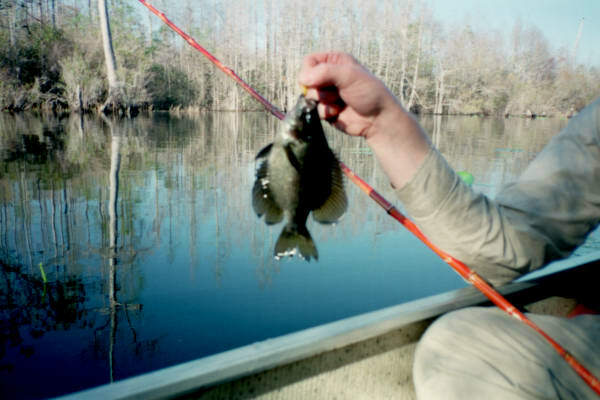 The Okefenokee National Wildlife Refuge is a biologically rich ecosystem - a vast bog inside a huge saucer-shaped depression that was once part of the ocean floor. 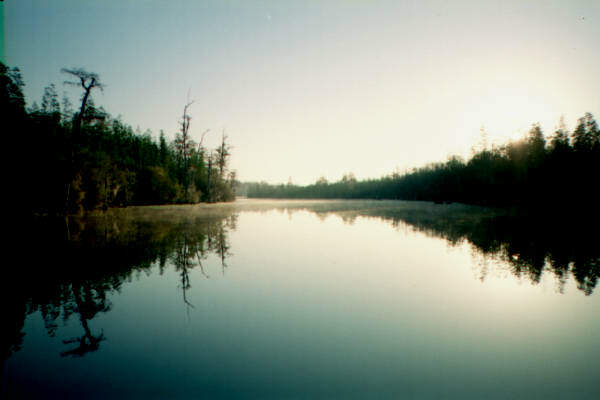 Of the 438,000 acres of swamp, approximately 354,000 acres are designated wilderness. 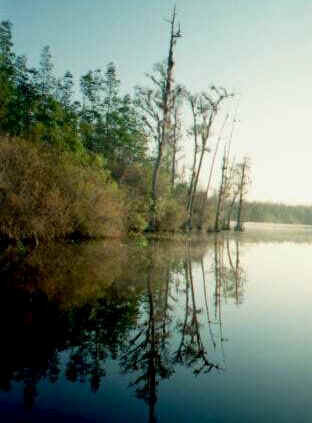 It is home to endangered and threatened species including the wood stork, the red cockaded woodpecker, the indigo snake and the parrot pitcher plant. It is also one of the last strongholds of the Florida black bear. 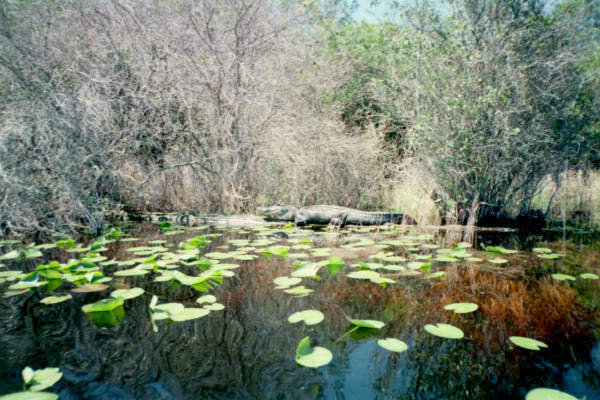 The natural integrity of the Okefenokee, one of the largest and most primitive swamps in America, is in jeopardy. DuPont has plans to mine for titanium on 38,000 acres on Trail Ridge along the eastern boundary of the refuge. The mine will be an "open pit" mine and will be in operation for 50 years. DuPont will begin the process of applying for the necessary permits at any time. This operation could alter ground and surface water inflow and could change water holding capacity of the swamp. If this happens, water levels and swamp ecology will be irrevocably changed. Several thousand acres of wetlands will be mined. Mining in this area may effect endangered species and their habitats, including red-cockaded woodpeckers, indigo snakes and wood storks. The mining process may release contaminants attached to soil particles and degrade surface and ground water quality. Potential contaminants include herbicides, insecticides, mercury and iron. Releases or spills of oil, grease, and hydraulic fluids from mining equipment are also a threat. The discharge of storm water could increase siltation and alter water quality along the edge of the mine operation and in streams leading away from the mine. These concerns are relevant not only to the Okefenokee Swamp, but also the St. Mary's River to the east of the mine area. Air quality may also be affected by the mining operation. The mining will generate dust, smoke and soot as the land is cleared and exhaust and dust from vehicles and heavy equipment. Increased noise and light pollution could significantly degrade the unique wilderness experience for refuge visitors. DuPont has a dubious environmental record which extends back to the1930s. Among other things, in 1991 the EPA fined DuPont for dumping corrosive acids and toxic solvents at their Deepwater, N. J. Chambers Works facility. Also in 1991, a report done by the National Institute for Chemical Studies named the DuPont pesticide facility in Belle, West Virginia as the worst polluter in the Kanawha Valley. In 1989, DuPont was listed on the Council on Economic Priorities short list of worst environmental offenders, for being the number one toxic polluter. Write letters to DuPont expressing your concerns about this project. Send a copy to us- we need a record of the comments DuPont receives to hold them accountable for their responses and report the volume of concern to the news media. If you have a little more time, please send copies to President Clinton and Bruce Babbitt, Secretary of the Interior. Here is a letter I received from a visitor to this page. 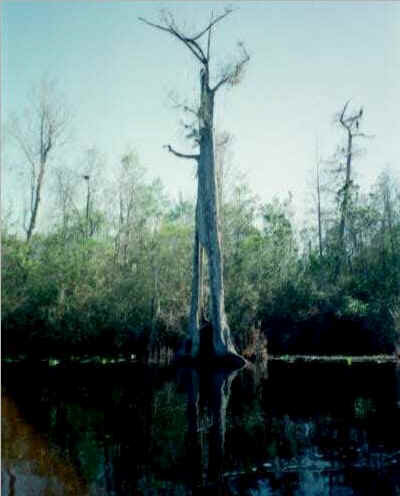 It beautifully conveys what is at stake when risking environmental damage in the Okefenokee. From my visit there, I learned of tremendous destruction of the swamp throughout our history there. For example, none of the ancient, giant Cyprus trees remain, as they were all milled. The swamp is struggling to survive and recover some of what it once was. 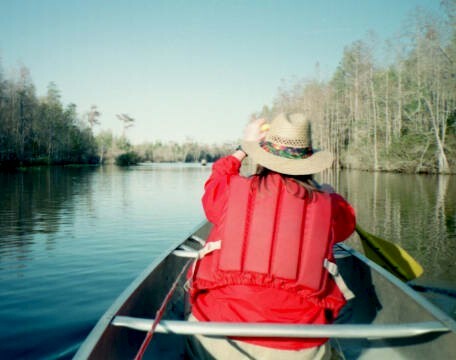 In Nikki's letter, we see the importance of preserving the Okefenokee for future generations. We also get a sense of friendly the people are in the area. This unique place should not be put at risk. our area. If DuPont makes a mistake, our entire area could be damaged. visit again if you ever get the chance. The spot the bream was caught (in the center, between the bush and the bank, in the shade) - the only spot anybody caught anything that day!